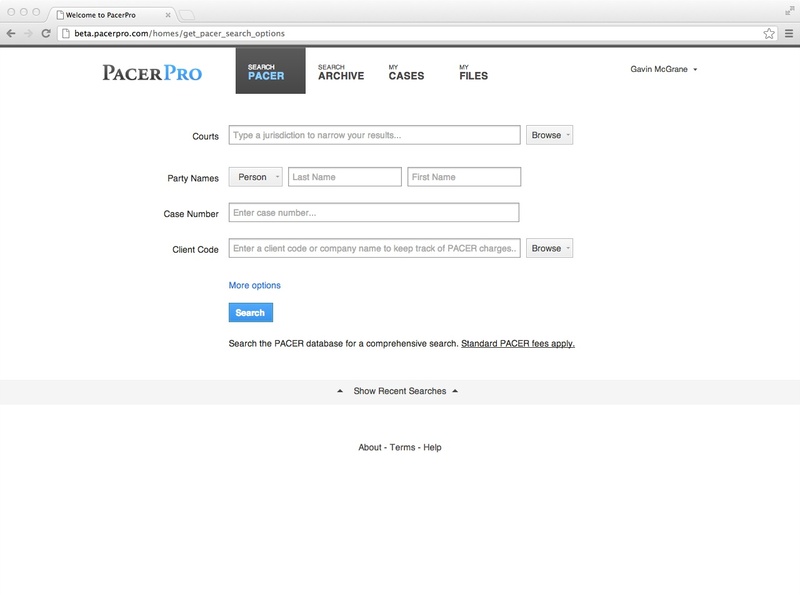 Have you ever used Pacer to retrieve federal docket information? Did you enjoy the experience? C’mon, now, be honest. It pretty much stinks, no two ways about it. There is little doubt that Pacer – the massive on-line nationwide database of U.S. Appellate, District, and Bankruptcy court records, with 214 separate databases and an estimated trillion documents – is sorely in need of a modern make-over. But I wouldn’t recommend holding your breath while the federal government gets around to doing that. In the meantime, two entrepreneurs have taken upon themselves the massive task and have come up with PacerPro – a much more pleasing web-based skin and set of tools for anyone wishing to interface with Pacer. John Sanders, previously of Apple and Autodesk, and Gavin McGrane, an attorney, have quietly spent the past couple of years combining their legal and technical expertise to develop PacerPro, which makes searching Pacer simpler and, dare I say it, even enjoyable. Gavin and John kindly offered me the opportunity last week to watch PacerPro in action and provided me with the overview of the product, which launches today as a preview release. PacerPro definitely leverages the Pacer databases, but changes how researchers interact with them. Pacer users are familiar with the form-driven search interface that makes creative searching incredibly difficult – it is nearly impossible to hone in quickly on the exact document you may be looking for in the traditional Pacer interface. But with PacerPro’s streamlined look and feel – with intelligent search fields for the Pacer search tool and a Google-like natural language interface for the archive tool that accesses all Pacer docs that PacerPro’s users have retrieved, results are easier to find, sort and scan. There are tools to bookmark cases under the My Cases tool, and the ability to store documents in folders so that you can find them easily at a later time and “sync” the documents with other users, via their email. Imagine – you can directly share a Pacer document with someone else electronically! Space-age! What makes it even more space-age is the companion mobile iOS app – you can access your collected resources stored in PacerPro on your iPad. Even offline. Even while on a plane or in a courtroom. Very cool indeed. 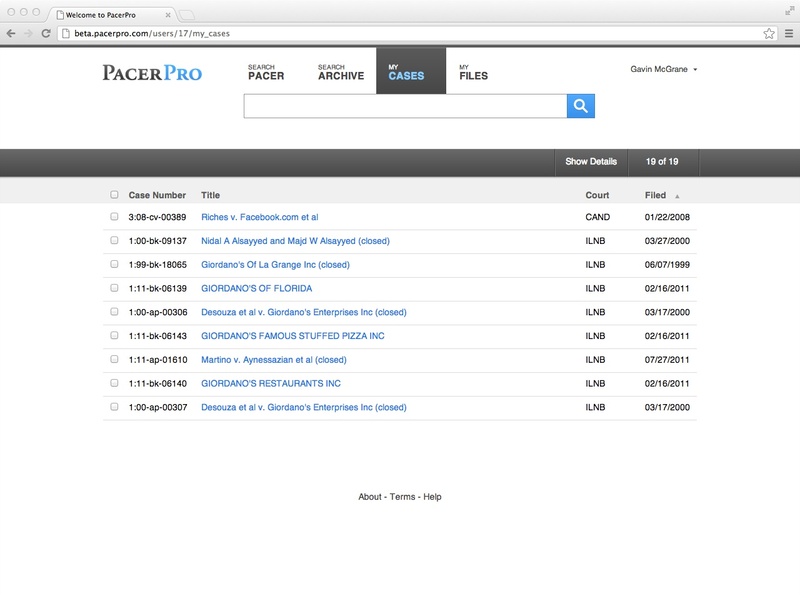 Searching PACER – PacerPRO’s robust search tools’ capabilities include: Search across multiple courts simultaneously to find a complete set of records. Filter these results to identify relevant cases quickly. Save past searches. Document Management – Once the relevant information is retrieved, users can bookmark cases for easy access. 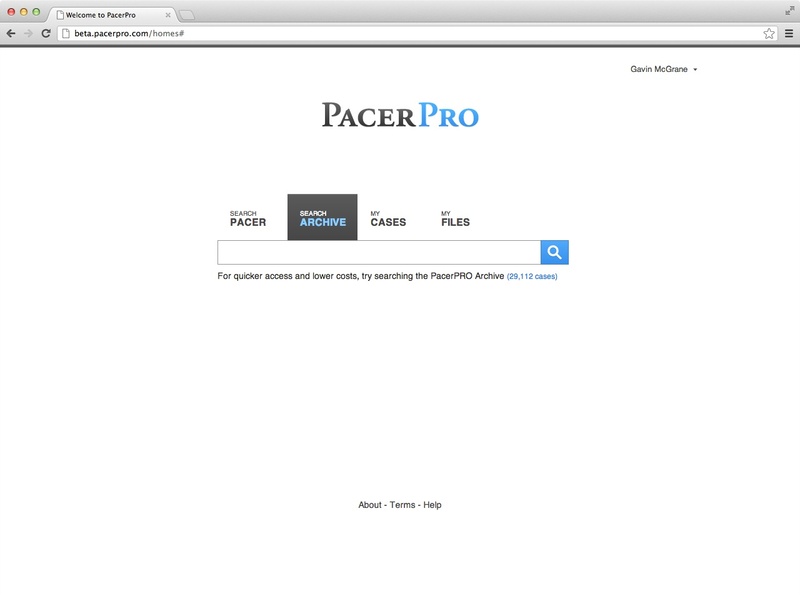 PacerPRO automatically indexes the docket for quick and easy searches. Electronic files make it easy to create and save collections of documents, reflect changes in the docket, and organize document collections. Mobile Access – Entirely web-based, PacerPRO provides attorneys access to important case information anywhere at anytime. And, thanks to PacerPRO’s iPad application, attorneys can now take curated docket collections offline — great for places where internet access is not always available, such as the courtroom, on airplanes, and at depositions. No more delays while you update paper files. 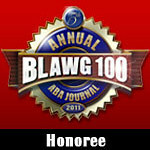 No more lugging boxes full of binders stuffed with pleadings. 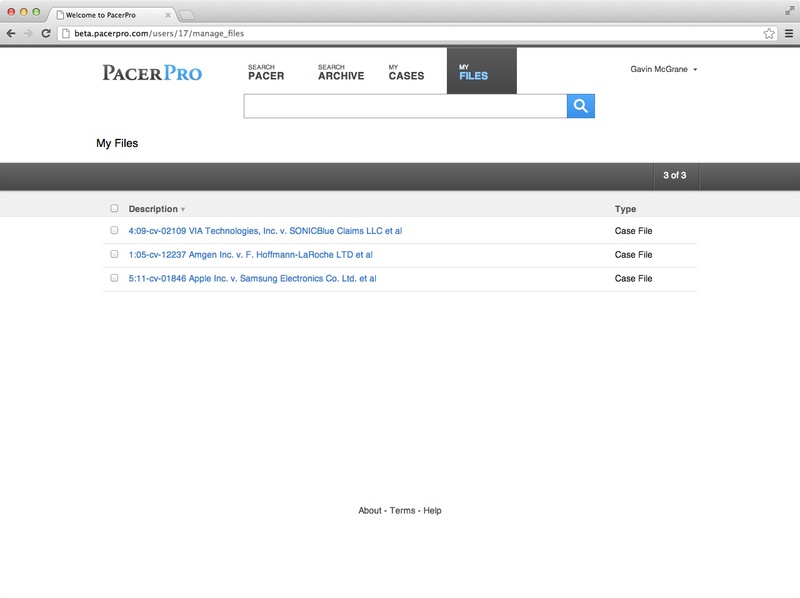 PacerPRO Archive – PacerPRO is in the process of compiling our own archival database. The PacerPRO Archive returns results with simple, one-word or boolean searches. We are constantly adding to the PacerPRO Archive. Archive searches are free. No doubt, Gavin and John have taken on a pretty big task. 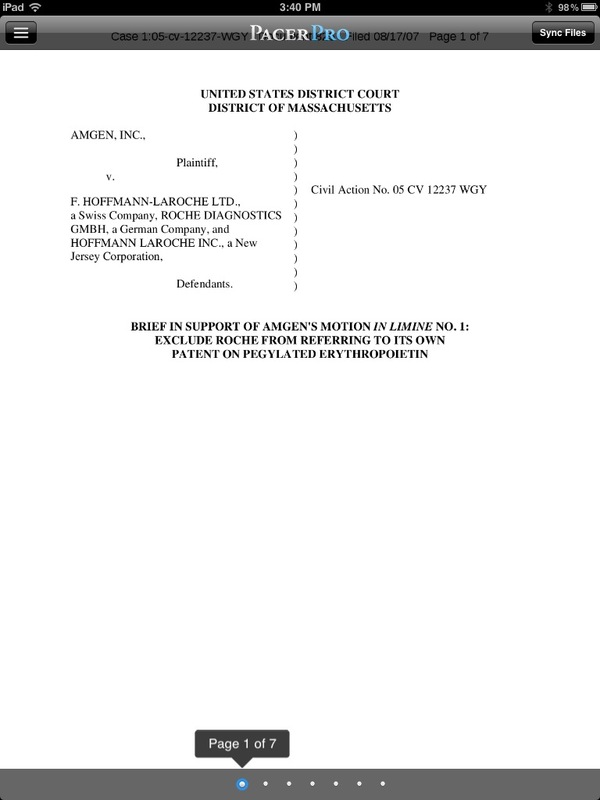 But it seems they have risen to it with a nicely designed product that will help litigators or anyone neading ready access to federal docket materials interact with Pacer more easily and with a lot less pain, from pretty much anywhere. The service is not free – the PacerPro online subscription will cost $25 month, which represents a special introductory price. The iPad app is also subscription based, at $15 a month. Plus your usual Pacer charges when you request a document, although archive searches are free. Remember, the archive is all documents that PacerPro users have requested via Pacer – the archive is a secondary database automatically created and accessible via natural language search. So, while it won’t be cost effective for the infrequent user, the time savings alone may be worth the cost for heavy Pacer users, litigators and anyone else needing regular, quick access to the federal courts. I wish Gavin and John all the best with their application – they clearly have seen a need and filled it nicely. 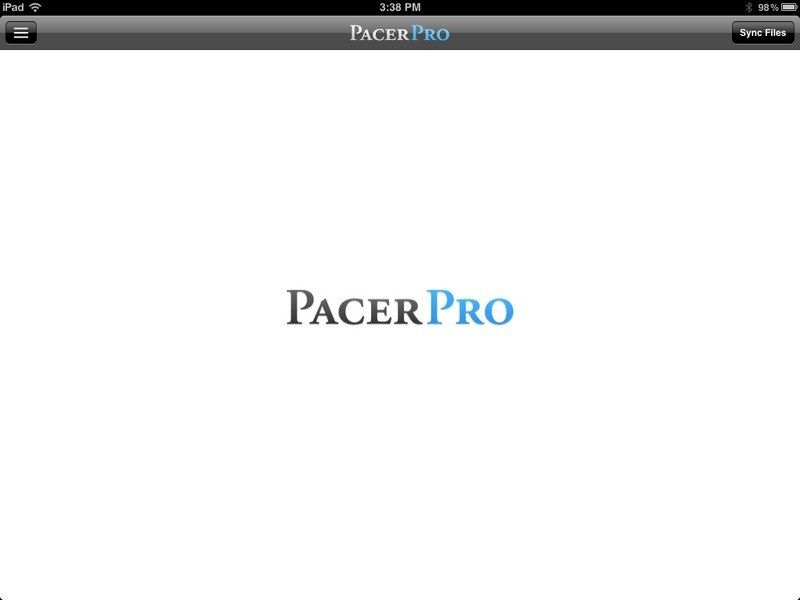 Looking forward to playing with PacerPro myself. You can find more about it at their newly live website at pacerpro.com. Or follow them on Twitter at @pacerpro.